Card Text When you play this card, treat it as a copy of an action card in your opponent’s discard pile. Flavor text It is said that if you travel far enough across the Crucible, you will eventually meet yourself. If an action card copied by Mimicry includes an Æmber bonus, do I receive that bonus? Yes. 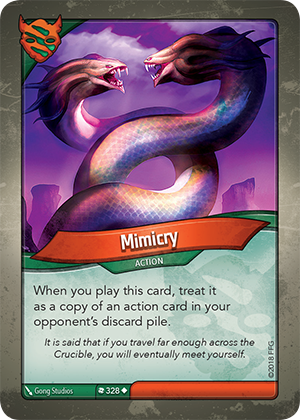 Mimicry is considered an exact copy of the whole card, so you also gain the Æmber bonus for playing it.